The provincial government has made it clear that Site C is about meeting future electricity demands. But the province is currently energy self-sufficient; we are a significant net exporter of power. According to BC Hydro’s own growth forecasts, by 2024, the annual energy demand, after the current conservation plan, will almost equal the projected annual energy supply — without Site C.
This would seem to indicate that when Site C comes online, almost all of the 5,100 gigawatt hours of electricity produced annually will be in excess of projected demand within the province. The CBC analysis suggests two possibilities: Power for LNG operations in British Columbia or power for tar sands extraction. 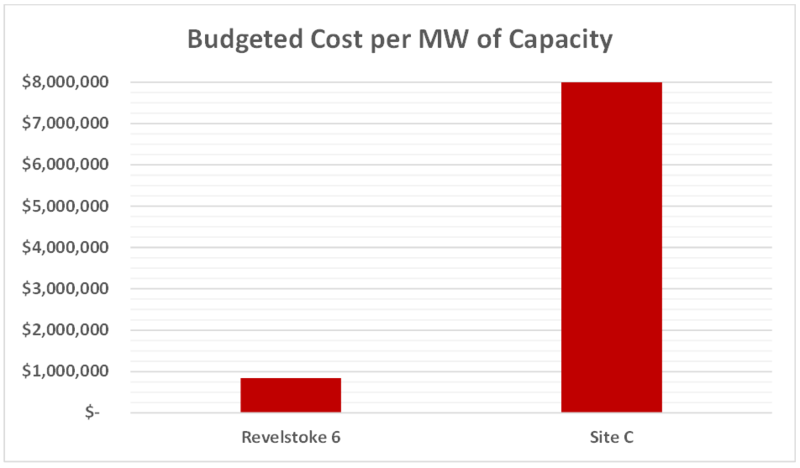 Is there a business case that would prioritize Site C over Revelstoke 6, a facility that would face almost no opposition? If there is a detailed business plan, it has not been disclosed by the provincial government. BC Hydro has been contracting with independent power producers at prices in the $110-per-MWh to $130-per-MWh range. Site C was projected to cost between $87 and $95 but that was before its capital budget increased by 11.4%. Electricity sales agreements with industrial users, in place and proposed, exceed BC Hydro’s projected costs. Perhaps the Liberals believe the apocryphal story about making up for losses on every unit by selling more units. Why proceed with a project that produces power at almost 10 times the cost of a simpler alternative? Why create capacity that is to be sold below cost? Is there a comprehensive business plan that justifies proceeding with Site C in 2014? Is there a comprehensive business plan that justifies provision of below-cost power to industrial users. Is clean hydro power intended to facilitate carbon-saturated emissions? Who needs Revelstoke power, when we have IPP and Site C contractor friends to reward. Revelstoke Generating Station Unit 6 Project : project description / BChydro. 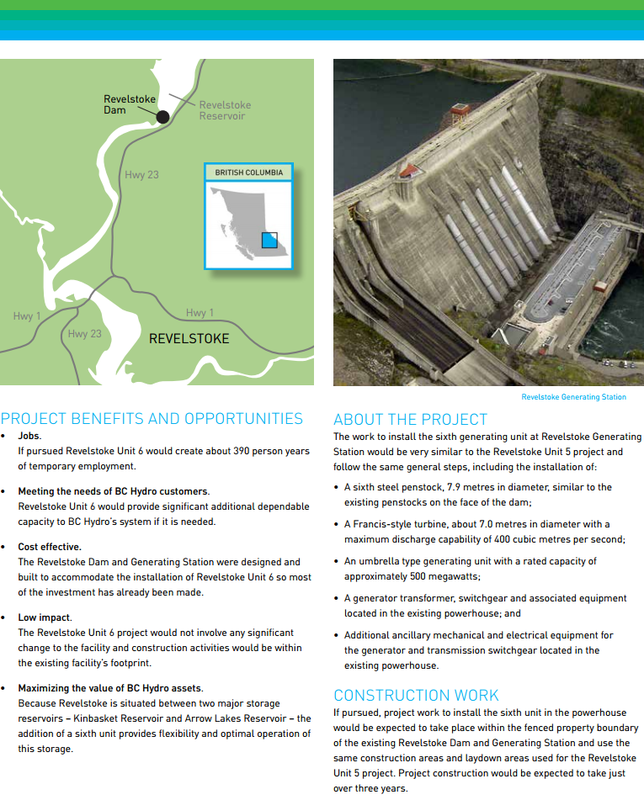 Revelstoke Generating Station Unit 6 Project : factsheet. The answer is yes. Please contact SNC Lavalin and/or Kiewitt Flatiron GP for a copy. Ding Ding ! We have a winner. Cheap power for LNG and a huge puddle of free water to drink from are desirable . But the construction of the huge debacle pays large. I wonder if Christy has connections in the white elephant industry ? Nothing to do with the post; I just wanted to jump in before you shut 'er down for Christmas. I extend to you and all your family, the very best wishes for the holidays and in the years ahead. Thank you so much for all the work you put in to keep us informed. I don't know how you do it and still have a life. Norm, I'll echo Hawgwash's sentiments. Thanks very much for what you do. This province is so screwed under this Liberal regime. We need to recall 8 Liberal MLA's and take back majority of the Legislature before it's too late! Demonstrating that Brad Bennett, as Chair of BC Hydro did not feel compelled to tell the truth about BC Hydro. Why would the utility add more IPPs when they already have a power surplus and will have it for years to come. Unless, the aim was to deliver more cash to friends supplying private power. I am curious: Would it also be possible to add a 7th generator at this site, as it currently sits? If so, that seems like a MUCH better option than Site C.
No. If you look at the photo of the dam, you’ll count four darker colour pipes and one lighter one against the face of the dam. Those feed generators. Four were installed about 1984 while the fifth, on the right, was completed in 2011. A sixth generator was provided for in the dam design but that will complete its capacity. Another thing to keep in mind is that adding capacity through a sixth generator means the dam can produce more power in a single moment but availability of water to drive the machines that create electricity determines total power created over time. So adding more generators may allow more power to meet peak demand (although that hasn’t changed in years either) but it may not mean the utility’s annual power output rises. Low water would limit the ability to keep six Revelstoke generators operating continuously. So Brad Bennett is saying that publicly-owned BC Hydro has to spend $9 billion on Site C in order to back-up and accommodate the overpriced, un-needed, intermittent power from existing and additional IPPs. We can also exercise our right to the “Canadian Entitlement” under the Columbia River Treaty. That would supply us with at least 1176 megawatts capacity annually. Currently we are selling that electricity to the US at $30 per megawatt hour. Much cheaper alternative than Site C’s $83 per megawatt hour. I haven’t read Alice in Wonderland recently, but it brings to mind the phrase “Curiouser and curiouser”. How could anyone in their right mind propose such an idiotic scenario as Site C? How could anyone in their right mind allow it to proceed? And we elect these people because they’re supposed to be smarter than the average bear?